Has anyone else noticed a sudden influx of birthdays?! Maybe just us, but we’re not complaining as that only means one thing…birthday cake! 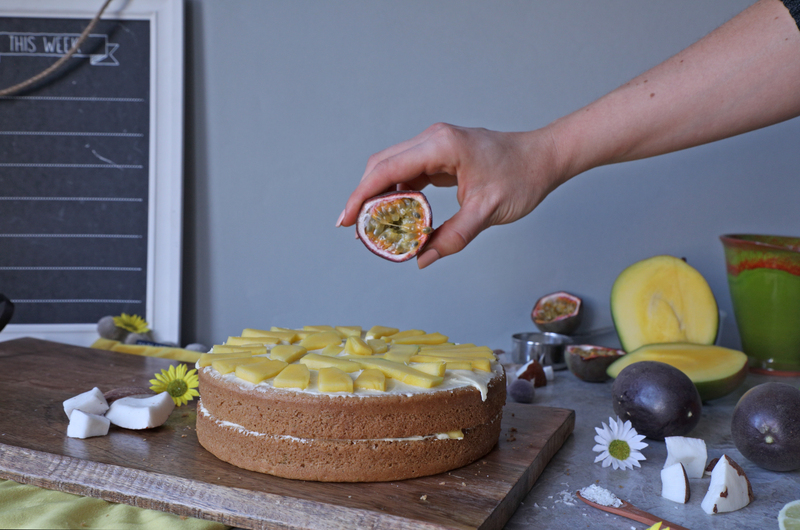 Luckily for us (and you, too), we’ve teamed up with Tesco (#AD) to recreate their Vegan Birthday Cake, and I’ve got to warn you, this one is pretty epic! Although we’ve always been partial to a carrot cake, switching up the fruity flavours couldn’t have been more welcomed, and our guests at the weekend couldn’t have agreed more. Safe to say there isn’t any left! But we know what you’re thinking…can a vegan version really be as good as the real deal? Well, it was a resounding yes from us! 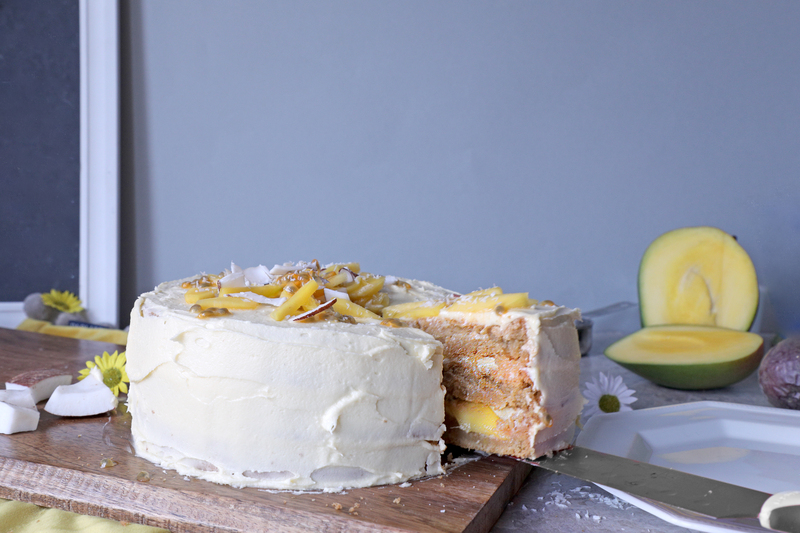 The fruity mango layers only adding to the flavour and consistency of each slice, you certainly won’t be questioned for going back for seconds. I think I will let the pictures speak for themselves from here. Do let us know if you give this one a go! 1. Preheat the oven to gas 4, 180°C, fan 160°C. Lightly grease and line the base and sides of 3 x 20cm loose-bottomed cake tins with baking paper. 2. Give the tin of coconut milk a good shake to mix together well, open it and add the cider apple vinegar directly into the tin. 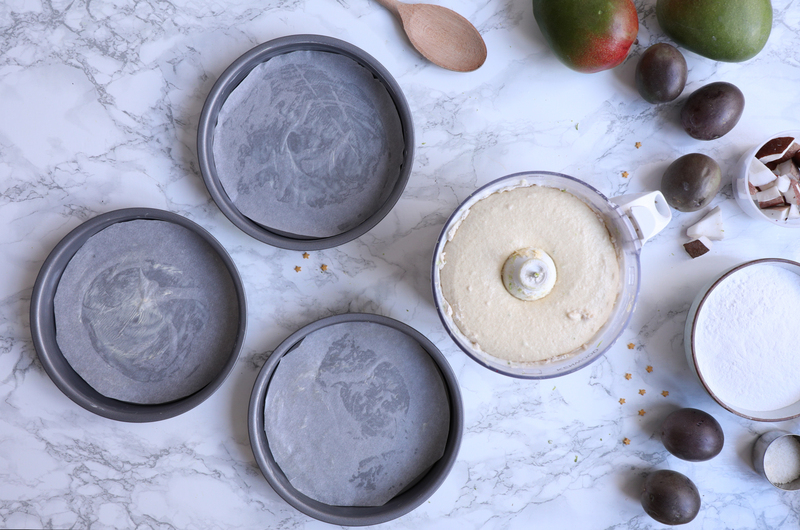 Stir and leave for 10 mins, then put the dairy-free spread, sugar, coconut milk, vanilla extract, flour, baking powder, bicarbonate of soda and lime zest in the bowl of a food processor and mix until it forms a smooth batter. 3. Divide the batter equally between the prepared tins, smoothing the surface with a palette knife. Put the tins on baking trays and bake for 30-35 mins or until golden on top, springy to the touch, and the cakes are just beginning to come away from the edges of the tins. Cool in the tins for 10 mins, then carefully turn out the cakes and peel away the baking paper. Place on cooling racks and leave to cool completely. 4. Meanwhile, prepare the icing. In a large bowl, beat together the dairy-free spread and icing sugar until smooth. Cut 1 of the passion fruits in half and tip the seeds into a sieve placed over a small bowl. Press the seeds with a spoon to release the juice and measure out 1 tbsp – you may need to use another passion fruit if they are particularly small. Add the juice to the icing and beat until smooth. 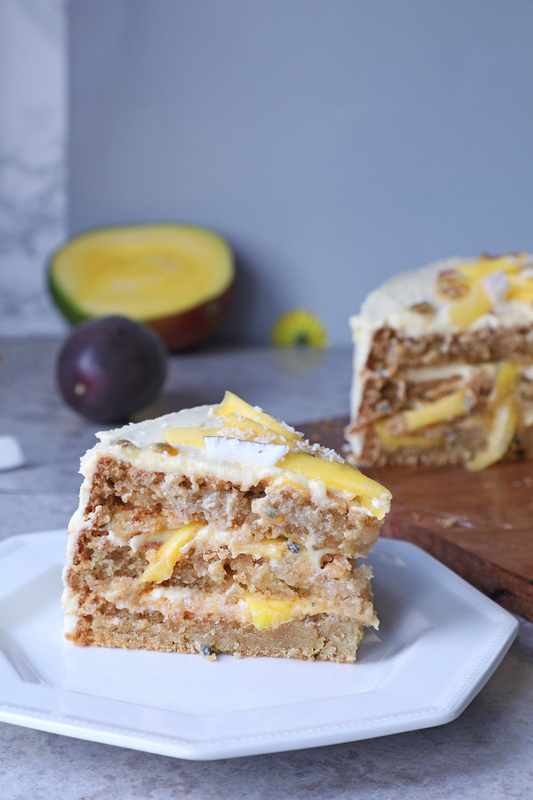 Don’t be tempted to add extra passion fruit juice or the mixture will split. 5. Once cooled, place 1 cake on a serving plate and spread over a quarter of the icing. Arrange a third of the mango slices over in an even layer over the top and scatter with the juice and seeds of 1 passion fruit. 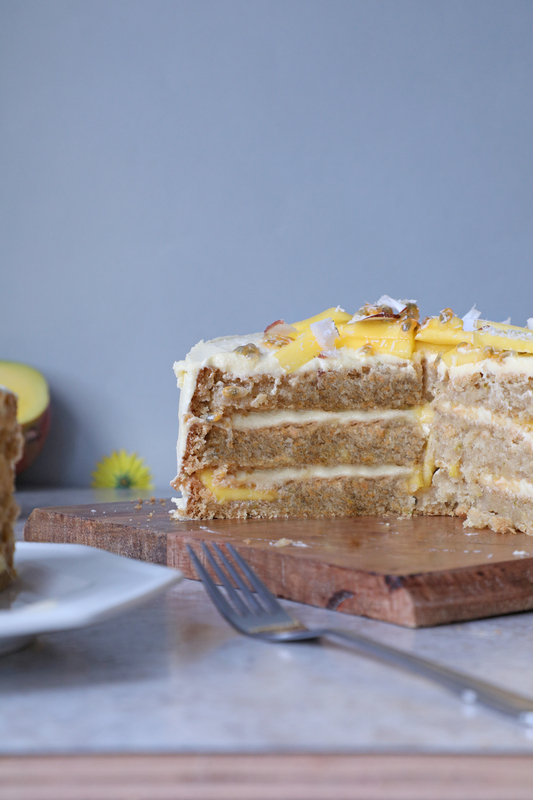 Repeat with the second cake, another layer of icing, mango and passion fruit. 6. 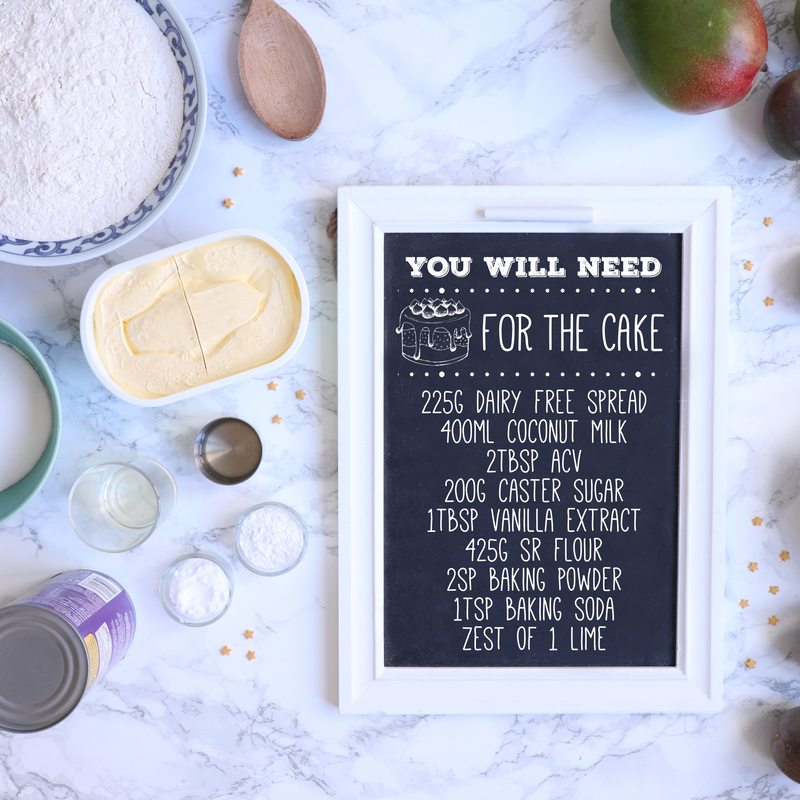 Place the final cake layer on top and use the remaining icing to cover the top and sides of the cake in an even layer, smoothing with a palette knife. Sprinkle over the desiccated coconut and decorate with the remaining mango slices and passion fruit seeds. 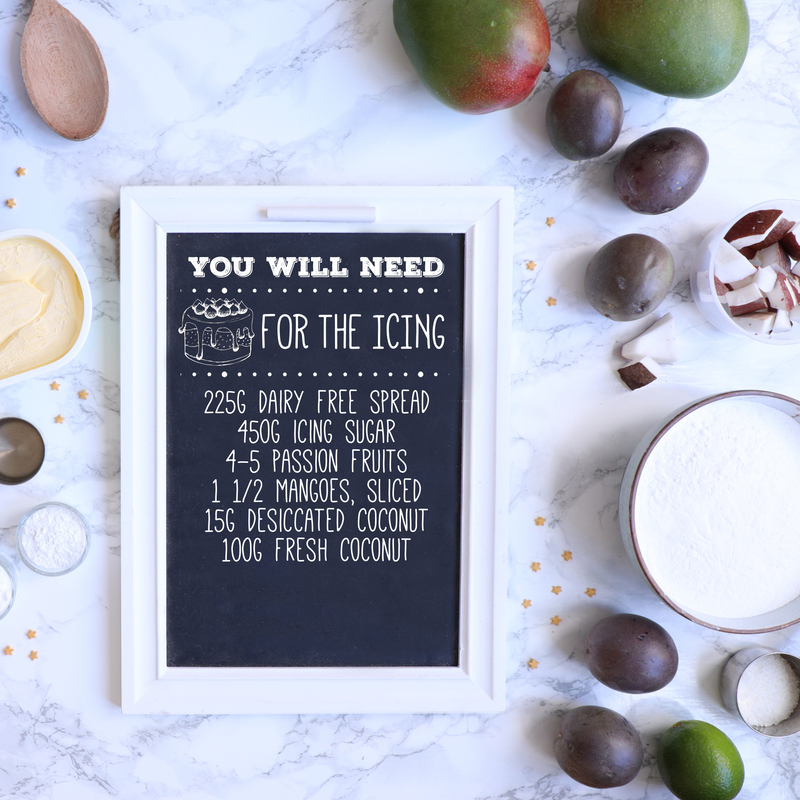 Use a vegetable peeler to peel shavings of the fresh coconut chunks and scatter over to finish. Best eaten on the day of making, but the cake will keep in an airtight container in the fridge for up to 2 days.